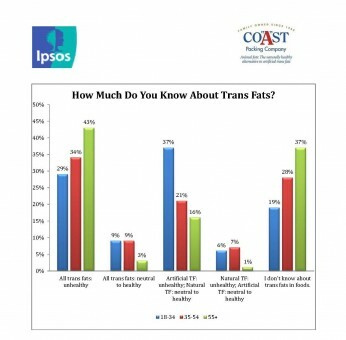 VERNON, Calif. (March 21, 2016) – Nearly a year after the FDA mandated the removal of artificial trans fats from processed foods by 2018, a new consumer survey from Coast Packing Company and Ipsos Research indicates many consumers remain confused about the entire subject of trans fats in the American diet. The results confirm that there is a lack of understanding about trans fats among almost two-thirds of American adults: 64 percent either think that all trans fats are unhealthy (36 percent) or don’t know about the health aspects of trans fats in foods at all (28 percent). While almost five times as many respondents know that artificial trans fats in foods are unhealthy while natural trans fats are neutral to healthy (24 percent) — compared to 5 percent who incorrectly think that natural trans fats are unhealthy and artificial trans fats are neutral to healthy – the vast majority simply aren’t aware that there are different kinds of trans fats and that not all trans fats are toxic. Nutrition labels on processed foods indicate the amount of trans fats but do not distinguish between artificial and naturally occurring trans fats. The survey of 1,000 adults, conducted in late February, examined awareness of trans fats in the American diet, specifically the differences between artificial trans fats – which are manufactured and added to food during processing — and those trans fats that occur naturally in foods derived from animals. Because artificial trans fats have been linked to an increased risk of heart disease, the Institute of Medicine (IOM), a division of the National Academies of Sciences, Engineering, and Medicine, recommends a trans fat intake as low as possible. In June 2015, the FDA made it official, determining that trans fats in processed foods are no longer Generally Recognized as Safe (GRAS) and ordering their phase-out within three years. “A great many consumers don’t understand the difference between artificial and natural trans fats because they simply haven’t been told,” said Eric R. Gustafson, CEO, Coast Packing Company, the number one supplier of animal fat shortenings in the Western United States. “Trans fats in processed foods have long been regarded, correctly, as a public health problem, but the discussion has rarely called out the distinction between toxic artificial trans fats and potentially healthful natural trans fats. Today, nutrition labels don’t make it clear, so it’s not surprising that confusion prevails in the marketplace. While 24 percent of the sample overall recognized the distinction between artificial and natural trans fats, for millennials, that figure rose to 37 percent – and just 19 percent of that group said they were unaware of the health aspects of trans fats. At the other end of the age spectrum, just 16 percent of those 55+ indicated they were aware of the difference between artificial and natural trans fats. The Coast/Ipsos survey revealed a striking gap in awareness based on income: 40 percent of those with annual incomes above $50,000 regarded all trans fats as off limits, while just 30 percent of those with incomes of less than $50,000 did – a population that may well include millennials. On a regional basis, 41 percent of those in the Northeast placed all trans fats on the do-not-consume list, versus 33 percent of those in the South. By gender, 10 percent of men overall saw no health issue with trans fats of any kind, compared to just 4 percent of women. Families with children were marginally less likely to believe all trans fats are unhealthy, and were more likely to know about the health aspects of trans fats in food. Education proved to be a differentiator as well, but perhaps not as anticipated: 43 percent of those with a college degree said that all trans fats are unhealthy, while only 30 percent of those without a degree held to that view – a disparity that nearly mirrored the results for those who are married (40 percent) vs. those who aren’t (31 percent). In late 2015, a Coast/Ipsos consumer survey found that that younger Americans are more receptive to animal fats in their diet than their elders — and are eating accordingly. The survey of 1,000 adults examined how attitudes about animal fats in the American diet have changed in recent years – and how consumption patterns may be changing as well. Respondents were asked whether they were more or less open to animal fats, and whether those views extended to actual behavior. The Coast Packing/Ipsos study was fielded from February 25-28. Ipsos eNation surveys consist of a minimum of 1,000 completes with adults 18 years of age or older in the contiguous United States. The sample includes individuals selected from the online segment of Ipsos’ iSay/Ampario Panel, and is balanced to be representative of the general population based upon region, gender, age, and household income data from the U.S. Census Bureau. Results have a margin of error of +/- 3 percentage points. For a copy of the survey results, please email admin@edgecommunicationsinc.com.